← What Is This ‘Tithing’ Thing About Anyway? Recently I have begun one of life’s most irritating tasks: packing. As I prepare to move into my new house (at some point or another eventually!) I have spent a lot of time packing and labeling boxes. Kitchen: Fragile. Kitchen: Junk Drawer. Books: Seminary. Books: HEAVY! Craft Supplies. There are some boxes on which I want to simply write: STUFF! I like labeling things and I think we all do in some ways. Maybe not everyone likes to have their whole lives divided neatly into labeled file folders, but I would guess that most of us find ourselves labeling things, at least in our minds. It is not just the office supply geeks or organizing nuts among us. The truth is, it is probably human nature to categorize and label things so that we may better understand them. This really isn’t a bad thing. When we see a robin, we label it ‘bird’ in our minds. We learn that the label ‘bird’ means feathers, bill, wings, funny looking feet, and some other odd things. So, when we see another creature that is labeled ‘bird’ we can skip over learning some things about it because there are givens in the label. When we see a crow, which is also labeled ‘bird’ in our minds, we can assume it has those same characteristics, give or take a bit, as the other birds. Saves time. In fact, it is a big part of how we learn and retain information. This also saves time when it comes to basic survival. If an animal is labeled ‘bird’ in our mind, then we do not have to be as worried as we would if it were labeled something like ‘snake’ or ‘lion’ or ‘wasp’. Where would we be without labels like street signs? Stop. No Parking. One Way. Labels on medications: do not drive while using this medication. Take with food. For external use only. How about cleaning products? Do not spray towards face. If swallowed, contact poison control. And we can’t forget food labels. Best used before January 1992. Remove plastic before placing on baking sheet. And of course clothing. Dry clean only. Lay flat to dry. Wash with like colors. It is our instinct to label and without them, life could get really complicated really fast. However, labels can also be hurtful and harmful things. They can be used to separate and exclude, pass judgment and control our perception of things. They can be words into which we pour our hate and anger. Labels like the prisoner number tattoos from the Nazi concentration camps. Labels that cruel children give to one another. I remember little notes that mean kids would put on the desk of a chubby little girl in their class that said things like ‘fatty’ and ‘blimpy’. The graffiti labels on a boy’s locker that said words I dare not speak from the pulpit. The ugly and hate-filled labels that people spit at one another just because they look different or come from the wrong places, speak the wrong language or speak a language differently. 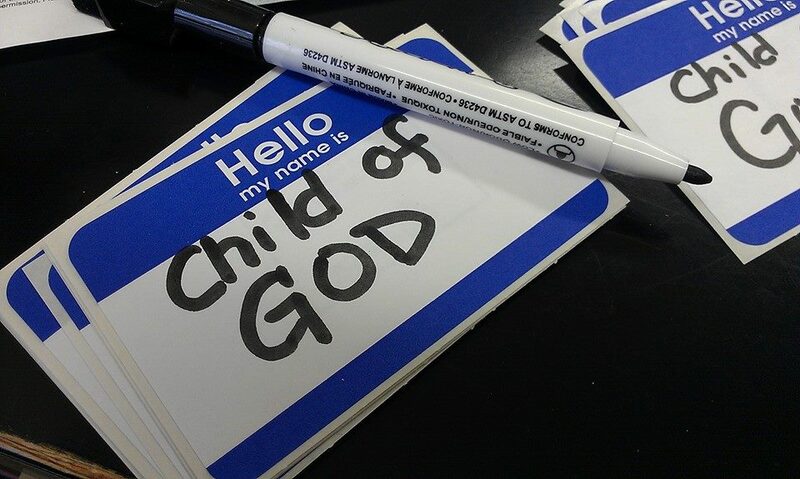 At some time or another in our lives, we have all borne a label like these. At some time or another, we have all labeled someone else, too. Jesus definitely wore labels in his life. Reject. Heretic. Outcast. One Who Eats With Sinners. One Of Them. Friend of Prostitute. Blasphemer. Hated. Despised. And, at the end, his cross bore the label: King of the Jews. And, if Jesus took on our sins and brokenness, which he did, then he took all our labels, too……. Want to read more? Visit the Shepherdess Writes or, even better, visit us at 11am at Shepherd of the Hills. This entry was posted in Worship and tagged christian, Christianity, church, Grace, Jesus, lutheran, religion, scripture, sermon, Sylva, worship. Bookmark the permalink.